Christmas is in air and there is no escape from the charms of reds and greens that have taken over everywhere. Most malls and shops have massive Christmas trees laden with tantalizing gifts, trinket and baubles and the eye-catching year end sales is definitely gripping most of us. My shopping is done. Though the weather is chill and crisp outside, our Christmas tree glow has warmed up our living space. My baking pans are out. Oven has been heating up and the warmth from the oven has kept my kitchen space cozy and comfortable. Though baking had taken a relative backseat in the past few weeks, with the summon of Christmas and New Year season, I am all set to don my baking cap in bid to bake the traditional Christmas cake at home. Every year, Christmas season brings back fond memories from Mangalore when we as teens would eagerly look forward to those cakes and baked goodies sent by our neighbors. I can well remember the plates filled with baked goodies, neatly wrapped in a kitchen paper and beneath it unveiled beautifully adorned rose cookies, plum cakes, candies, biscuits, cashew macaroons and many other stuffs, names of which I can't even recall. Though there wasn't much festivity at our home per se, mom surely made it a point to get freshly baked fruit cakes (commonly called as Plum cakes in Mangalore and most parts of Southern India) which most bakeries in Mangalore excel in during this season. It was her way in calling for a celebration. One can't help but soak up in Yuletide feel as Mangalore gears up to transform to a tantalizing carnival city. Christmas baking is not an essential ritual at home, but somehow the entire spirit of Christmas takes over me and I feel enthusiastic to celebrate this way. While my husband was away in US recently, I put aside thoughts of baking a cake this year. But as DH returned home, I was curiously questioned by him on what I would be baking this Christmas. Looks like he had absorbed the Christmas spirits well abroad. A little push again and I asked him what he would love to have for this Christmas and I instantly got a reply from him without any forethought saying "Fruit Cake please!". Last year I baked this Christmas Fruit cake which has been our favorites. This year however, I had no fruits soaking and hence sought for an instant solution. A bottle of coffee liquor perched on my kitchen shelf has been looking for my due attention since long and this time again it was Nigella for my rescue. Line the sides and bottom of a 9 inch spring-form pan with a layer of baking parchment paper. Cut the parchment material into strips that are twice as high as the tin itself. The height of the strips will protect the cake from catching on the outside of the cake tin and prevent over baking of the cake edges. Place the fruit, butter, sugar, honey, coffee liqueur, orange zest and juice, mixed spice and cocoa into a large wide saucepan. Heat the mixture until it reaches a gentle boil, stirring the mixture gently as the butter melts. Simmer the mixture for 10 minutes. Remove the saucepan from the heat and leave to cool for 30 minutes. After the mixture has cooled, add the beaten eggs, flour, ground almonds, baking powder and baking soda. Mix well with a wooden spoon until the ingredients have combined. Carefully pour the fruitcake mixture into the lined cake tin. Transfer the cake tin to the oven and bake for 1 1/2 to 2 hours or until the top of the cake is firm, yet with a shiny and sticky look. At this point, insert a sharp knife into the middle of the cake and test for done. Remove and place the cake on a cooling rack. Once the cake has cooled, remove it from the tin. Top the cake with a glaze of your choice or candied fruits or simply place a few chocolate coated berries in the center and sprinkle some icing sugar on top of the cake. I am inspired by Nigella’s book Feast: Food to Celebrate Life. You just can't go wrong with this recipe. I love the way Nigella decorates her cakes. Simple and homely, yet tastefully elegant. Using prunes in baking is fairly new to me. So I stuck to the recipe by words and the only change I made was to use 2 eggs instead of the 3 mentioned. To compensate, I increased the quantity of baking powder and soda from 1/2 tsp to 1 tsp. My mixed spice was homemade and freshly ground with cinnamon, cloves, cardamom and nutmeg going into it. This recipe fetches approximately a kilo of the cake. The cake is rich, dark, moist and absolutely delicious... laden with goodness from fruits with strong notes from prunes, fruity richness from raisins, nuttiness from almonds, subtly spiced with earthy flavors from honey and muscovado sugar. If you love fruits in your cakes, you bet this will hit you with the right tones. Heavenly! The festive spirit of Christmas embraces one and all as it spreads joy and happiness everywhere. Here's wishing everyone a Merry Christmas and a Happy New Year! I am sending these to Bakeomania hosted by Suma Rowjee of Cakes and More. 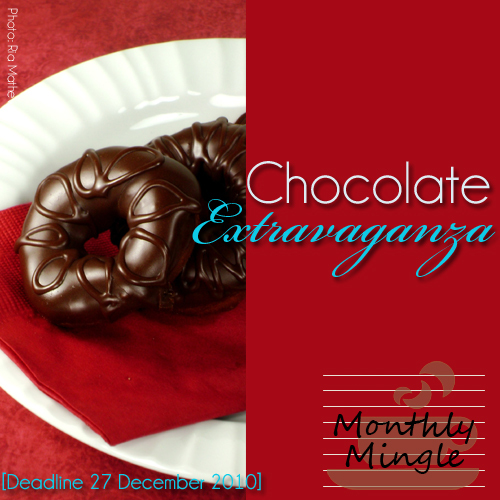 Also sending them to the Chocolate Extravaganza - Monthly Mingle hosted by Ria. Sarah of Maison Cupcake is hosting a new blogging challenge 'Forever Nigella' and here goes my entry for the same. thats a decadent cake. loved reading this post. merry Cheistmas. OMG that looks scrumptious... beautiful pictures. And the cake is so moist.. hope u all had wonderful time eating the cake.. Good job Mallika. Love your new layout.Delicious looking cake with wonderful ingredients.Happy Holidays to you. The chocolate Christmas Fruit Cake looks beautiful. I have tried nigella’s recipes and I must admit they never fail. Your chocolate fruit cake enhances the Christmas spirit. Happy Christmas. Merry Christmas..Thanks sis for that mouth watering delight...heavenly cake.. Extra ordinary and marvellous cake, soo tempting..Xmas wishes to u and ur family..
oh i love all the pic's especially the batter ones....looks awesome! Wow the pictures are out of the world and the cake too.. Thanks guys for all those warm wishes and compliments. Hope you had an awesome time with your family and friends!